The sky continues to fall in Fortnite Battle Royale, and as does the free content. Following last week’s patch to the hit, free to play multiplayer game, which included a limited 50v50 mode and the powerful LMG weapon, Epic is closing out Season 3 of Battle Royale with a small update that nevertheless makes some appreciated changes to the tried and tested ‘last person standing’ formula. 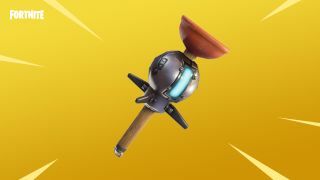 Patch v 3.6 has gone live across PS4, Xbox One, PC, and iOS as of today, and the big news is that it introduces the “Clinger” sticky bomb, a throwable grenade that can attach to surfaces (including enemies) and do serious damage following a timed explosion. The Clinger is Uncommon in rarity, which means you won’t find it around the map as frequently as normal grenade types, but Epic has confirmed that each pickup contains a stack of three, and they’re located in chests, llamas, supply drops, and as a piece of floor loot, so regular players should be able to acquire one without too much trouble. The grenade does up to 100 damage to players and 200 to structures, after a 2.5 second delay upon hitting its target, and you can stack up to ten in an inventory slot at any time. As a result of this new item hitting the Battle Royale meta, Epic has reduced the prevalence of Remote Explosives in the game, with its chances of being found in chests now diminished by 40%. In other notable news, update 3.6 buffs up the minigun to become a more viable weapon for combat, especially after last week’s LMG appeared to undermine and supplant its importance as a high power firearm. Epic has increased the minigun’s accuracy and reduced its recoil by 10%, while Epic and Legendary variants of the item have had their damage boosted by 2 hit points per shot which, considering its fire rate, is not insignificant by any means. Hopefully this means we’ll see more miniguns in use by the end of the week. More hotfixes and quality of life improvements have also been included in the patch, too. Fences will no longer prevent you from crafting, squad mates spawn closer to each other on the starting island, and the Port-a-Fort should be a bit more manageable to build and use for players, but these are just a couple of highlights among a host of tweaks made this week, all of which are laid out in Epic’s detailed patch notes. Patch 3.6 is the final update to Fortnite Battle Royale before Season 3 ends next week, which will supposedly usher in a game-changing event, as many believe the in-game meteor seen soaring across the sky is due to strike within the next seven days, bringing with it a terraformed map and a brand new mode called “Impact” (if data mined leaks are to be believed). Battle Pass owners, that means you don’t have very long to finish up your challenges and max out those tiers for that coveted Level 100 John Wick outfit, but don’t worry if you’re tight for time - we’ve got a complete Fortnite Battle Pass Challenges guide to help you earn every Battle Star you can get before Season 3 closes up.